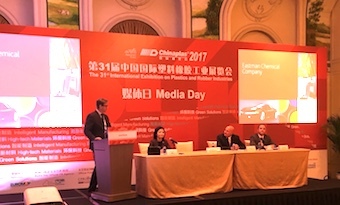 Burt Capel, vice president and general manager of Eastman’s Specialty Plastics business unit, introduces the company’s new cellulosed-based bioplastic at the pre-Chinaplas media event in Guangzhou. Cellulosic materials leader Eastman Chemical Company has brought its breakthrough engineering bioplastic to Chinaplas 2017 in Guangzhou. TRĒVA’s composition is about half cellulose, sourced from trees derived exclusively from sustainably managed forests that are certified by the Forest Stewardship Council (FSC). The new material is also BPA-free and phthalate-free. The non-bio-based components include acetic acid and acetic anhydride, and Eastman adds that moving forward, the intent is to increase the bio-based content. Leveraging the inherent properties of TRĒVA, such as chemical resistance, excellent flow characteristics, superior surface gloss, and low birefringence, Eastman is targeting several fields for application of TRĒVA, including eyeglass frames, wearable electronics, headphones, and many other personal devices that come in direct contact with the skin; electronic display applications. such as lenses and covers, that consumers need to see through; electronics, housings, intricate cosmetics cases, and other products with high design and complex specifications; and automotive interior components wherein chemical resistance and aesthetics are desired. “Eastman leveraged nearly 100 years of cellulosic expertise in the design and testing of TRĒVA TM to meet the improved sustainability profile and performance needs of brands, fabricators, molders, and other companies across the value chain,” said Burt Capel, vice president and general manager of Eastman’s Specialty Plastics business unit. TRĒVA’s benefits are reportedly three-fold: sustainability, end-use performance, and design and brand flexibility. Its excellent flow rates, durability and dimensional stability, for example, allow for reduced material usage, thinner wall parts, and longer product life, thereby enhancing lifecycle assessments. In addition, TRĒVA reportedly offers excellent chemical resistance, standing up better than other engineering thermoplastics to some of the harshest chemicals, including skin oils, sunscreens, and household cleaners. Furthermore, the material’s low birefringence eliminates the unwelcomed rainbow effect some plastics experience with polarized light, thereby improving the user experience with electronic device screens and retail displays. Further, excellent flow characteristics also enable design freedom, allowing TRĒVA to be used with complicated designs and in filling thin parts. Under recommended processing conditions, recent thin-wall 30 mil spiral flow testing shows that TRĒVA flow rates are significantly superior compared with polycarbonate and polycarbonate/ABS blends, and comparable to ABS. TRĒVA is also designed to allow for superior surface gloss, clarity and warm touch and feel, enabled through a combination of the base material and Eastman’s technological expertise. The material also boasts great color saturation, and superior secondary processing and decorating capability, thereby creating additional design and branding options. Eastman is exhibiting at Chinaplas at Hall 12.2 .